The Department of Statistics provides a statistical consultation service to support all academic and administrative staff of the University of Pretoria, as well as masters and doctoral students, with their empirical research whose research component forms a substantial part of their degree (at least 50% of total credits for the degree in question). The nature and extent of the research should be of such that it is publishable as an article in an accredited journal (please follow the link to obtain the list of accredited journals: List). It is expected that the contribution of the statistical consultant/s results in co-authorship of any published paper emanating from statistical assistance. See more detail below in this regard. Please read the Guidelines for the use of the ISCS carefully. 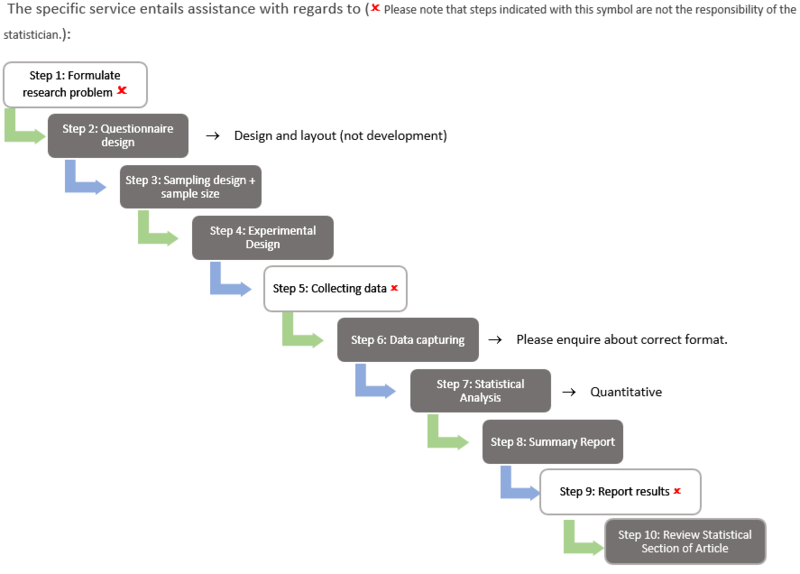 A Brief summary of your research protocol should be attached to the application. Please note: Incomplete applications will delay project review. The aim of the internal consultation service of the Department of Statistics is to support and enhance the research function of the University by raising the standard of implementation of statistical methodology. Applicants must complete and submit the online application form, where after they will be contacted by a statistical consultant for a first consultation. Application for statistical support is not guaranteed and will depend on the availability of staff and overlap with existing research activities. It is strongly recommended that clients contact the consultancy at the onset of their project. Students are required to obtain approval from their supervisors before requesting consultancy services, and it is expected that supervisor(s) attend at least the first consultation. We reserve the right to refuse consulting with the student should this condition not be met. The statistical team does not act as the supervisor of any student and does not offer any supervisory contribution with regards to their field of study and their dissertations/theses. We reserve the right to refuse to capture and/or analyse data collected without the involvement of the internal consultation team at the onset of the research project, should the data not uphold the standards required for the analysis. We reserve the right to discontinue any assistance, analysis, or meetings of postgraduate student applicants without the input and regular contact and meetings with the supervisor(s). Consultations are conducted by appointment only. Should you miss an appointment with the ISCS team, you will need to reschedule the appointment with a lead time of at least 24 hours, depending on the consultant’s availability. Consultations are scheduled on a first-come-first-served basis. A Summary report of the statistical findings will be supplied to the researcher. The statistical team are not responsible for writing final reports/sections in dissertations/theses of research findings/results. The nature and extent of the research should be such that it is publishable as an article in an accredited journal. It is expected that the contribution of the statistical consultant/s results in co-authorship. This entails at least the editing of the statistical section of the article by the statistical consultant/s. For record-keeping purposes we require that an electronic copy of the final submitted article be sent to us at completion of the project and a notification should be send once the article has been published. It is the responsibility of the student/researcher to provide ample time for statistical consulting, and to inform the consultant of any deadlines; as a guideline, requests must be submitted at least 6 to 8 weeks prior to the deadline. New projects are not registered and undertaken during the months of mid-November until mid-January. Clients submitting projects during this time should note that any work/communication regarding these projects will only commence in February. Applications for statistical support form Masters students is subject to work load of consultants and statisticians, as well as other capacity constraints as directed by the Department of Statistics. Should the ISCS team present a workshop and/or guest lecture for your research group/department and there is still a need for further statistical support, the usual route as outlined above for requesting statistical support via the ticketing system has to be undertaken.